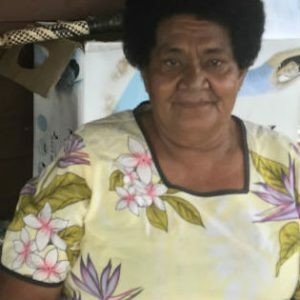 Just before Christmas, Sr Sesarina Bau made a joyful return to her home country Fiji – a very significant moment in her life. It was a time of goodbye to her family and kin and it was my joy and privilege to accompany Ses and share in the life of her family and friends in her culture, writes Congregational Leader, Sr Clare Nolan. Ses and I were among the first at the terminal, so we booked in, then were taken to Air Fiji boarding terminal. Four hours later, we arrived at Nadi airport and whisked through customs. We got our luggage and were taken to the next flight check-in – to Savusavu – booked the luggage in and there we sat. Out of the blue came a man dressed in police uniform and a man dressed in security uniform they introduced themselves to Ses. They were nephews, she said, and Ses was giving instructions. Next, some Sisters of Our Lady of Nazareth arrived. Sr Ina and Oni, escorted by Gertrude whom we all remembered nursed at St Vincent’s with us. Gertie has 34 grandchildren! They brought cakes, and sulu. The small plane rolled in, and we were off again! One hour later we touched at Savusavu and Ses’ favourite cousin, Bill, was there to greet us. Bill took us to get a sandwich and cup of tea and we started on our journey home. The road was a few miles of bitumen, then the gravel, through absolutely magnificent scenery. The cousins all along the way came out to greet Ses. She was quite overwhelmed. When we arrived, the feasting had begun: Rice, stir fry, paw-paw, pineapple and avocado. The next morning, Mother Monika, Ses’ cousin, and her sister-in-law, Vosita, dropped in. Serea, Bill’s sister, stayed with Marie and Bill to look after us. All day, nephews and grand-nieces came. Mud crabs turned up and were cooked, coconuts, lobsters and cakes were presented. Ses was speaking Fijian all day about her parents, reminiscing. The family – beautiful people – can’t believe how much Fijian she is speaking. 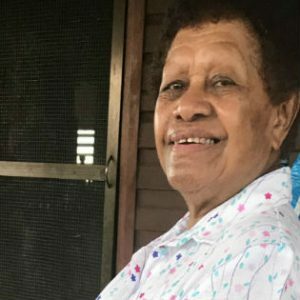 She never ever spoke Fijian on her home visits before. Her family has been told by Ses what to bring. We have about six sulus and a dress each for Christmas, which is on the December 18. Ses is up early the following morning, and saw the sunrise. After breakfast, she went out to the veranda and started talking to Bill. She is right back to her early days – parents, entering the convent, remembering, reliving, reminiscing. 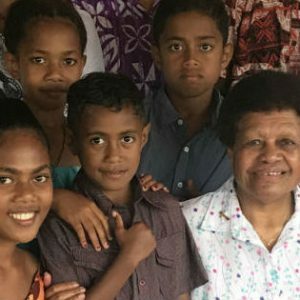 Her family is very grateful the Congregation has brought her to Fiji, but there is an awareness that Australia and the Congregation are her home. They say to her “we will always love you, but Australia is your home.” There is lots of laughter, but an enormous amount of respect for her. Everyone is getting ready to celebrate Christmas tomorrow. Ses wants a photo tomorrow of all her nieces and nephews, I hope that’s possible. I will try to get one. Then, it’s Christmas! This was their Christmas Day with Ses and her family in Fiji. Ses wore a lovely dress and she looked a million dollars. Christmas lunch was 1 pm Fiji Island time – people (all relatives) started to come from miles away some driving more than six hours. The last count I did was 35 adults plus beautiful children. They arrived with pork, chicken, prawns, uto breadfruit, taro roots, all wrapped in banana leaf and coconut leaf and cooked in the lovo (the below ground ovens). Everybody who came brought something. The table was set, and we were all called to attention by cousin Bill; the eldest nephew did a special welcome to Ses in Fijian. Bill interpreted it for me. Ses responded in Fijian and we all had tears. No one interpreted for me, but I was really moved. They situated the Christmas ceremony around the Last Supper, which was so moving. Her family are very spiritual and not afraid to share. I was asked to say the grace and Blessing. A lot of laughter was heard the whole day. The family can’t get over Ses and all her talking. This visit, she wanted the whole family to know she was there to say goodbye. It’s very hot and sticky, rain off and on, everything is run on solar power. No sun, no hot water, no power but who cares, you just wait. Ses doesn’t wait well. Ses went to bed saying: “Clare, all my family could run Fiji and do a great job.” I agreed with her. The fifth day of our visit dawned very cloudy this morning so we had to wait for the shower. Today, she wants to go to the Mission Station at Napuka. This was the school and parish she went to as a child. Ses was upset the church was not in good repair. Bill and Marie fundraise for the church. Her family appears to be the community support for the whole of this area, Bill has trucks and cars and he sends them out on Sundays to bring the people to Mass. The visit this morning has started Ses reminiscing again – romances, aunties not happy about her going out with boys, entering religious life, disobeying the Bishop, fighting with Mother General, her father disowning her, always loved and supported by her mother. Ses has such a story and this is all coming back to her. She talks of Mother St Agnes, who received her received her into the Sisters of Charity, Srs Bernice and Sarto who supported her. Tomorrow we have a Mass of Thanksgiving at 5 pm, celebrated by Marie’s cousin Fr Asaeli Raas SVD, and all the family will be back again. We have given 150 Fijian dollars to buy five buckets of ice cream and sweets for the children. On the second last day, Ses is sad about our days in Fiji coming to an end. The state of the church at Napuka upset her very much. Ses is thinking she might come back again, but I know this is not possible. Bill arrived home announcing that he has brought a priest, a Brother and a catechist to celebrate with us this evening. What a delight! Now to prepare the lounge room: Mats have gone down, fresh wild flowers prepared, readings chosen, children arrive to sing, table prepared, candles chosen, all is ready, sweeping done. Nephews, nieces, cousins once again coming from far and wide, Bill has gone to get the main Celebrant. All await in anticipation. Things happen so easily here. It is discussed and agreed so everyone participates. To me this is a great preparation, for Christmas, and an Advent I will never forget. The Mass of Thanksgiving was wonderful but saying goodbye is so hard. I stood beside Ses and we did it together. She did it in Fijian, so I don’t know what she said. However, I thanked them for welcoming me into their culture and into their lives. I promised them that the Sisters of Charity of Australia would always love and care for Ses and asked them to pray for us as we will for them. The two images I shared: The Isaiah first reading, it read “nothing is impossible with God ” and the Gospel: Mary’s yes to God “let it happen to me according to God’s will.” Both these passages were fulfilled tonight and Ses was here to say goodbye. The priest became very emotional and said he couldn’t respond. I shared it’s all about love and love is all that matters. Truly it was an amazing evening. The young people were the choir, a father and son served the Mass, the prayers of the faithful were spontaneous, Fijian and English /the dress of the people was so colourful, I was totally moved. Thank you, God for everything, it worked. Ses has said her goodbyes, and I have some photos and this story to prove it. My heart is full of gratitude and humility as I try to go to sleep, our last night in Fiji. It’s our final morning, and it is teeming with rain here so we are waiting for water to come on. The rain makes me wonder if we will be able to get out. 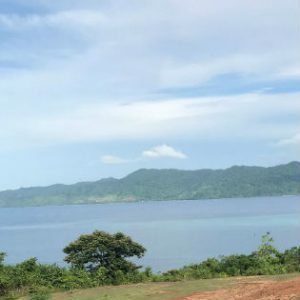 We make a start: It takes three hours to Savusavu over an all gravel road. We can’t miss this plane. We shouted all the family who came to say farewell to lunch; then Ses and I went to the airport and, of course, there was more family to say goodbye. After a beautiful trip over to Nadi, we are now waiting in Qantas lounge heading for Australia. And we are counting our blessings, grateful for the providence of God.